Prodded by labor unions, the Obama administration is taking its first step toward trying to fix the ailing airline industry, which could lead to a partial return to economic regulation. Transportation Secretary Ray LaHood is holding a forum with aviation stakeholders on Thursday to discuss the state of the industry and ways government can help provide economic stability for air carriers. The industry has been rocked by repeated crises in recent years, including the Sept. 11, 2001, attacks on the United States; the global SARS virus in 2003; skyrocketing oil prices in recent years; and the current economic downturn. "U.S. aviation is facing severe economic uncertainty and an open and frank conversation will help begin a continuing dialogue about the industry's future," transportation spokeswoman Sasha Johnson said. The Air Transport Association, which represents major carriers, says airlines are offering the fewest seats to passengers as measured by available seats and distance traveled in more than a decade. Airlines have shed more than 130,000 full-time jobs since 2000, and lost an estimated $33 billion during the same period. Thirteen airlines have filed for bankruptcy in the past two years. Related: What Goes on in Airline Cockpits? LaHood's invitation to stakeholders says the forum, closed to the public and the media, was organized at the request of the AFL-CIO's Transportation Trades Department. The AFL-CIO is the largest U.S. labor union confederation. Ed Wytkind, the trades department's president, said the industry has become dysfunctional, and all involved are suffering. He said he is hopeful the Obama administration or Congress will create a blue-ribbon commission to recommend solutions. "We can't keep doing things the exact same way and expect a better outcome," Wytkind said, adding that there probably should be consideration of new regulatory authority for the industry. Pat Friend, president of the Association of Flight Attendants, said she does not favor returning to the type of government supervision that existed before airline deregulation in 1978. "But there are some areas where we think you can tweak the deregulation," she said. Airlines are extremely wary of any discussion of a return to economic regulation. They contend they already are regulated and taxed heavily. The airline association declined to comment about Thursday's forum. But James May, the association's president and CEO, recently was grim about the industry's near-term prospects. "It is increasingly apparent that the economic head winds facing the airlines and their customers are anything but behind us," May said. Airline deregulation has been regarded as a success for consumers because airfares have declined. Other trends have raised worries about whether airlines are offsetting low fares at the expense of safety. A report last year by a government watchdog said nine large U.S. airlines farm out 70 percent of major maintenance. Overseas repair shops handled one-quarter of the work, challenging the ability of U.S. inspectors to determine whether it is done properly, the report said. Major airlines also have farmed out short-haul trips to regional carriers, which now account for half of all domestic flights. 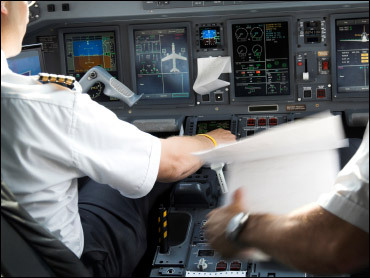 Regional airlines often hire pilots with significantly less experience and pay lower wages than major airlines. Both issues that have been raised in the National Transportation Safety Board's investigation of the crash of Continental Connection Flight 3407, which crashed near Buffalo, N.Y., in February, killing 50 people. The flight was operated for Continental by regional carrier Colgan Air Inc.